Welcome to Hy-Poxy Systems, Inc.
"A while back our dishwasher got a small hole in the bottom of it which caused it to leak onto our floor. The hole was caused when the heat coil, which was not properly supported, was being hit by the spinning washing arm. Over time the combination caused a small hole. I sure didn't want to purchase a new machine over this small hole so I started looking for a way to fix it. I first started with Marine-Tec epoxy, which has worked very well on my fiberglass boat. Within several washes in the dishwasher it loosened and became very rubbery. I then tried some JB weld I had laying around. It worked a little better, but ultimately ended with very similar results as the Marine-Tec. A friend of mine had received a kit of the HY-Poxy Super-Steel. I told him of my problem and he gave me the Hy-Poxy to try out. He said he wasn't sure if it would work on anything but steel, but it may be worth a shot. I cleaned and lightly sanded the area again and applied the Hy-Poxy Super Steel. It has worked unbelievably for 5 months now. It stuck down strong and hard as a rock and withstands 2 full cycles of washings a day, as we have 4 boys and my wife loves to cook creating a lot of dirty dishes. It wasn't until I visited the web site that I learned that its for certain plastics. Never the less it has worked very well where others have failed almost immediately under the same conditions. Just wanted to say how impressed I am with your product. I'll be using Hy-Poxy in the future and will tell others to do the same. formula weve ever tried. Dont change it. Otto S., Motor Service Inc.
"I received the order. The material is excellent! Thank you." Mo H., For Painting Buildings, LTD.
Hypoxy Systems Management has a combined experience of more than 70 years in the formulation, manufacturing and worldwide marketing of epoxy materials. Although basic epoxies have been used for many years, Hy-Poxy represents the new State of the Art in formulas, raw materials and methods of compounding. 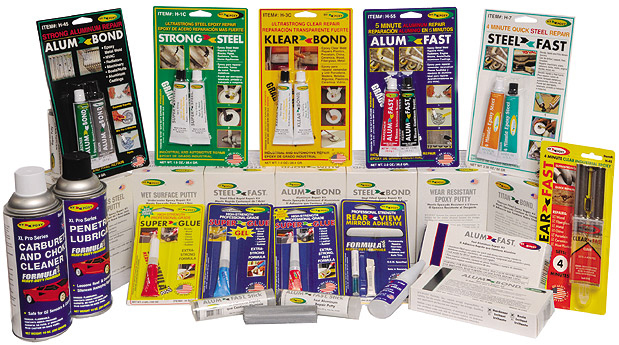 Our easy-to-use, two-component specially formulated epoxies harden without heat, pressure or special tools. Simply mix and apply! Every Hy-Poxy product has been chosen for its widespread need and is formulated to provide maxim strength, durability, chemical resistance and ease of application. Since these products have a very long shelf life, distributors and users can confidently maintain substantial stocks for both daily and emergency applications.